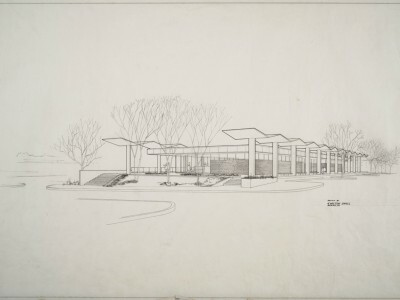 Rendering of proposed Student Service Center dated 1958. Image courtesy of/copyright NCSU Special Collections. 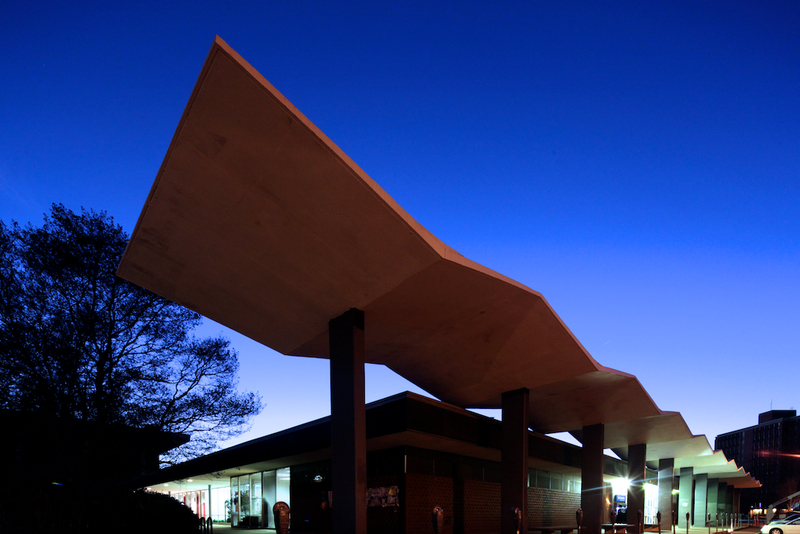 Designed by architect G. Milton Small, Jr. and built in 1960, it was originally known as the Student Service Center and is one of the most recognizable buildings on campus. It features distinctive folded plane canopies on both sides, although part of one of the canopies was removed in a 1971 expansion. Blueprint for Student Service Center. Image courtesy of/copyright NCSU Special Collections. 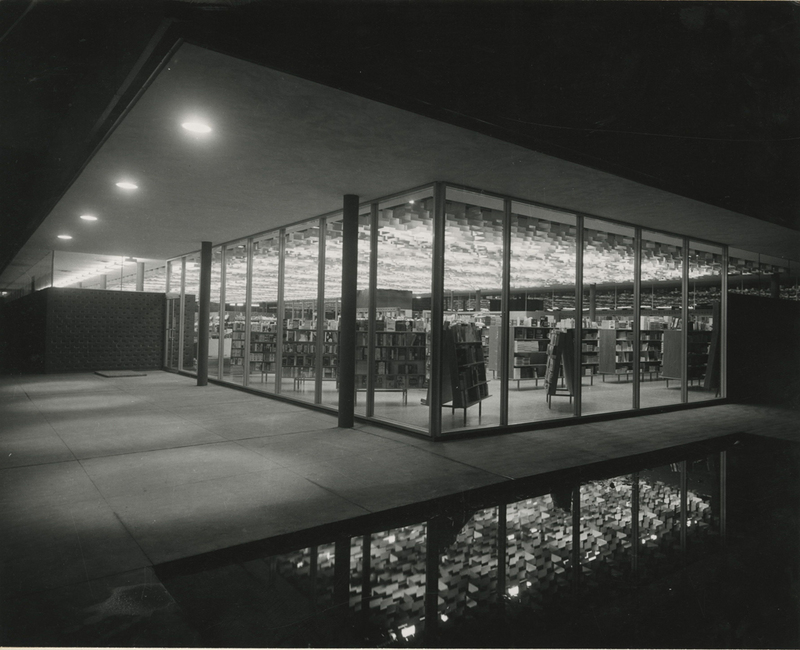 The Bookstore was built during a time of dramatic change for North Carolina State University, most especially for the School of Design. The first Dean of the new school, Henry Kamphoefner, quickly turned the School from that of obscurity to that of national prominence. He did this by recruiting some of the best young architects in practice to teach architecture at NC State. By reaching out to the star pupils of modern architecture masters, he was able to find some of the best talent in the United States. 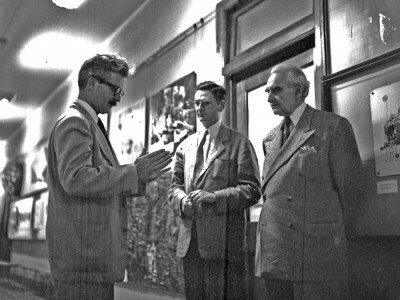 Dean Henry Kamphoefner, Professor Eduardo Catalano, and modern pioneer Richard Neutra. Image courtesy of/copyright NCSU Special Collections. 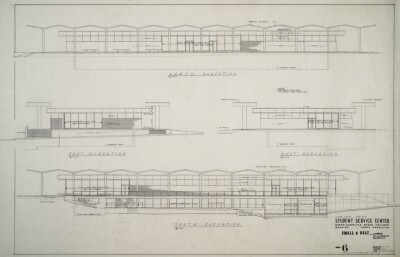 A few examples of this include George Matsumoto (student of Saarinen), Eduardo Catalano (student of Breuer and Gropius) as well as Milton Small (student of Kamphoefner and Mies van der Rohe). These NC State professors became masters themselves, designing some of the most recognizable and important structures in the south. 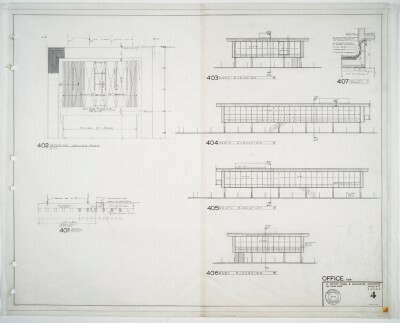 Blueprint for Milton Small's own office, near the corner of Brooks Ave and Hillsborough st. Image courtesy of/copyright NCSU Special Collections. After brief stint teaching at the School of Design and working for William Deitrick, Milton Small started his own firm. He went on to design numerous notable houses, commercial structures, churches, as well as educational facilities at Duke, UNC, and NC State. His own office building near the corner of Hillsborough Street and Brooks Avenue (above) is on the National Register of Historic Places. It was home to his firm for 34 years (later under G. Milton Small III and Kerry Kane). Small Kane Webster Conley PA is now located at 3105 Glenwood Avenue, a building they designed in 1980. Small’s former office building is now home to consulting firm NewKind (when are y’all going to put the koi back in the koi ponds?). 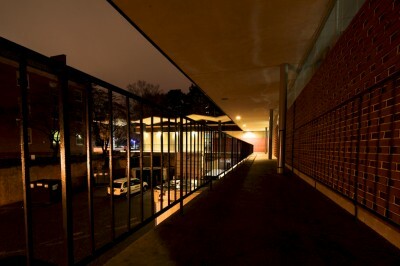 No other place in Raleigh has a higher concentration of modernist buildings as the ‘Modern Corridor’. Clustered around the area where NC State expanded in the 1950s and 1960s, it includes all building types: residential, commercial, ecclesiastical, and educational. The Bookstore is in the heart of this corridor. A little over a year ago, a campaign was launched to renovate and expand the Talley Student Center. Citing the inadequacy of the current building and growing student population, many pleaded for students to approve the measure. Almost 19 percent of the student population cast ballots on Oct. 5, and while 56.6 percent of the students agreed there was a need to improve the Talley Student Center and the Atrium, only 38.4 percent of the students agreed with the proposed student fee increases to pay for the project. Despite this vote, the NC State Student Senate passed a resolution to approve the fee and move forward with renovations anyway. Vintage postcard of the "Student Supply Center". 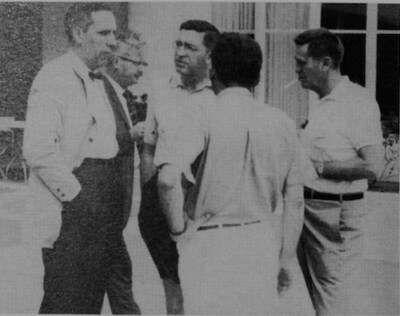 Image courtesy of/copyright NCSU Special Collections. You all might be surprised to know that some people at NCSU have no appreciation for Milton Small or his architecture. There has been some discussion about tearing down the NCSU Student Center […] The NCSU bookstore (which is beside the Horace Farlowe fountain) another Milton Small building is slated to be demolished. 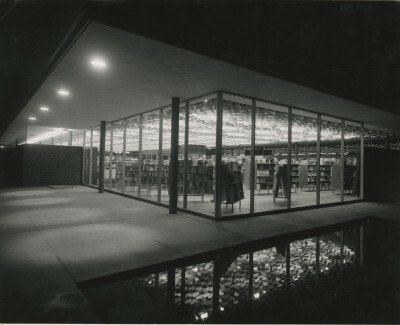 Historical photo of the Bookstore at night. Image courtesy of/copyright NCSU Special Collections. The current bookstore will be demolished, providing an enlarged green space for student recreation and relaxation. A new, expanded bookstore will be incorporated into the new construction of the student center. LEED certification doesn’t mean much when you’ve used thousands of kilowatt hours of energy to destroy a building and then send tons of debris to a landfill. 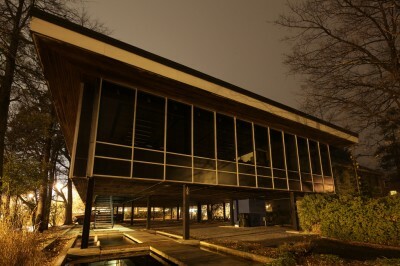 In 2005, while conducting an architectural survey for the City of Raleigh, historian and archivist Ruth Little placed this building on the Study List for the National Register of Historic Places. Unfortunately, since it does not yet have official historic status, it remains unprotected and vulnerable to being destroyed. Shared open space – The building is at the base of both campus tunnels, features a green area with fountains to the east, and picnic tables and a common area to the west. Character places – I’d make the argument that the bookstore is one of the buildings on campus with the most character. The zigzag canopies represent the era of Googie-style roadside architecture. These architectural traits were often employed by business owners to get the attention of passersby and draw business. The strategy works here too – it’s one of the few retail buildings on campus. Hub of interaction – This building incorporates pedestrian consideration around the entire perimeter, providing access to multiple parts of campus across two stories. Very few other buildings on campus have such considerations incorporated in to the design. One of the driving principles of all future NC State development is to create an urban feel to campus. This is to make best use of available land as well as provide an interesting pedestrian landscape for students. What makes an environment have an ‘urban’ feel is a series of new and old buildings, representing different eras of campus history. If we demolished all buildings once they reached the 50 year age mark (making them “outdated”, according to some) what would campus look like? So many buildings at NC State are chunky brick boxes with undersized windows and no otherwise interesting features. It comes as no surprise that it made the Princeton Review list as #10 Least Beautiful Campus. The Bookstore stands out as an exception to this with well proportioned features, floor-to-ceiling glass in some areas, and a low and unimposing profile. Modernism as an architectural style is rapidly making a comeback. 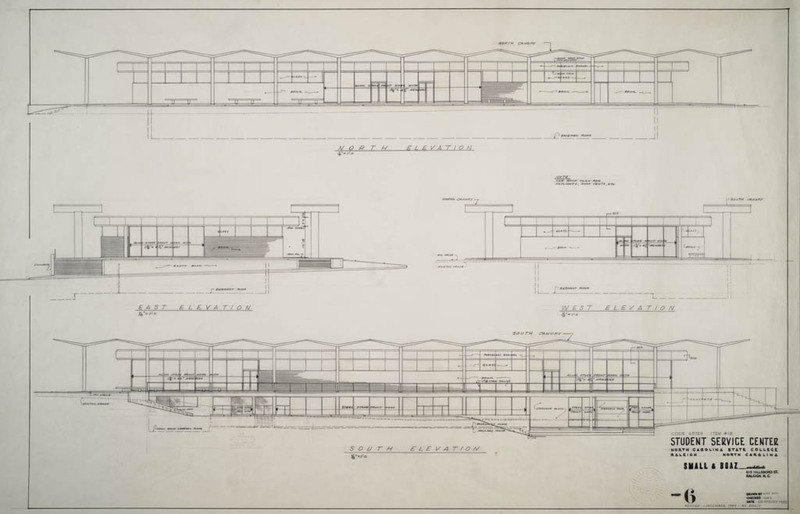 This is the type of structure that illustrates the role of the School of Design in shaping modern design throughout the southeastern United States. To be sure, it’s late in the game and the wheels are already in motion to move forward with demolition. However, it isn’t necessary to destroy the Bookstore in order to improve the Talley Student Center. One of the first things I remember about NC State was walking out of the Free Expression Tunnel to see a building with an interesting brick pattern and atomic-age retro shelters. There are only a few interesting structures on such a large campus, and this is one of them. This building has character, it has purpose, it is historic, and it is worth saving. 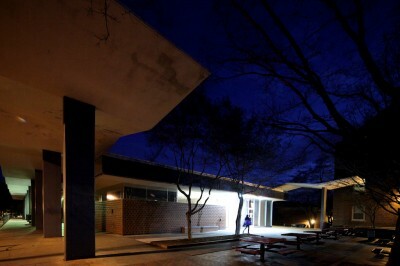 An opportunity was squandered when Eduardo Catalano offered a generous gift of building a hyperbolic paraboloid pavilion on campus. Let’s not make another mistake with regard to honoring the legacy of the School of Design. I’d like to give a big thank you to the NCSU Special Collections Research Center for being so helpful in locating the historic multimedia items used in this article. Losing this building would be a tremendous loss for the community. M. Small architecture represents something soulful, from another time, and as odd and sentimental as it sounds, as a freshman living in the Tri-Towers in the last ’90s, feeling so alone and overwhelmed in my new world, the Bookstore and Bragaw were the two buildings that brought me tremendous piece, reminding me that my beloved Uncle walked this campus two decades earlier than I, feeling as lost and overwhelmed as I, and he turned out to be one of the coolest people I know. I cannot imagine NCSU without these two buildings. They are so much more special than almost* any other buildings on campus. 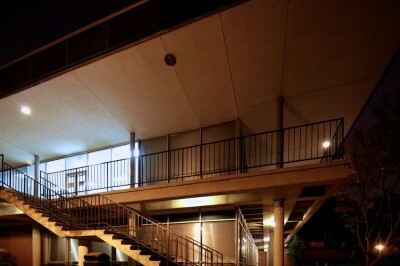 *I also love the Tompkins/Caldwell complex and it’s mezzanine overlooking the courtyard. Thanks for keeping us Alum in the loop! Awesome, John. I love this building. I’ve written an e-mail to the powers that be. Thanks for all of the details, John. This is one of my favorites on campus. I’d also wondered about the history of that office building currently housing NewKind; I had guessed that it had a story. I’m constantly trying to tell people why I love this campus so much and lack the aesthetic vocabulary to get my point across. The bookstore is one of the buildings I point to as an example of a great space at NCSU. Instead of continually failing to convince people why this place is beautiful, I’ll just start pointing them to Goodnight, Raleigh. I appreciate your efforts and wish you luck in saving the Bookstore. My preservation mantra: If it ain’t broke, don’t fix it. The Student Supply Store ain’t broke. Thanks for writing this wonderful article! I am a recent graduate of NCSU and frequently passed the bookstore during my daily walk across campus, not to mention making the occasional last minute stop to pick up a bluebook before an exam. Anyway, that’s my rant. Renovate, don’t demolish, save the architecture for another generation who will appreciate it. Why is no one from the College of Architecture standing up and calling this the short-sighted move that it is? 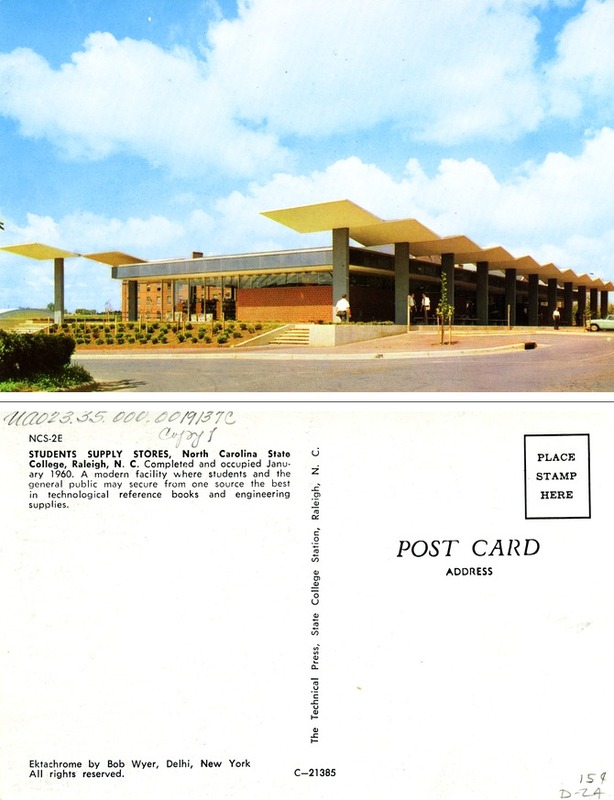 As a fledgling architect with G. Milton Small & Associates at the end of the sixties, I did some work on the design of this building and at one point was detailed to perform some construction supervision on the project. The structural engineer for the project, Ezra Meir, and his associate, Dr. Nick Uyanik, were concerned that the long wooden pilings which were being driven to help support the footings under those folded plate concrete canopies outside the building were not being driven down to what is generally referred to as “refusal.” This means that they should not sink down more than an inch with several blows from a 10,000 lb hammer/pile driver. I was to supervise the re-tapping of these pilings and some of them actually went down another 36″! If there had been any subsidence under these canopies, they would have cracked and possibly collapsed. Yes, this is a very significant structure on campus from an architectural and historical point of view and should definitely be preserved. 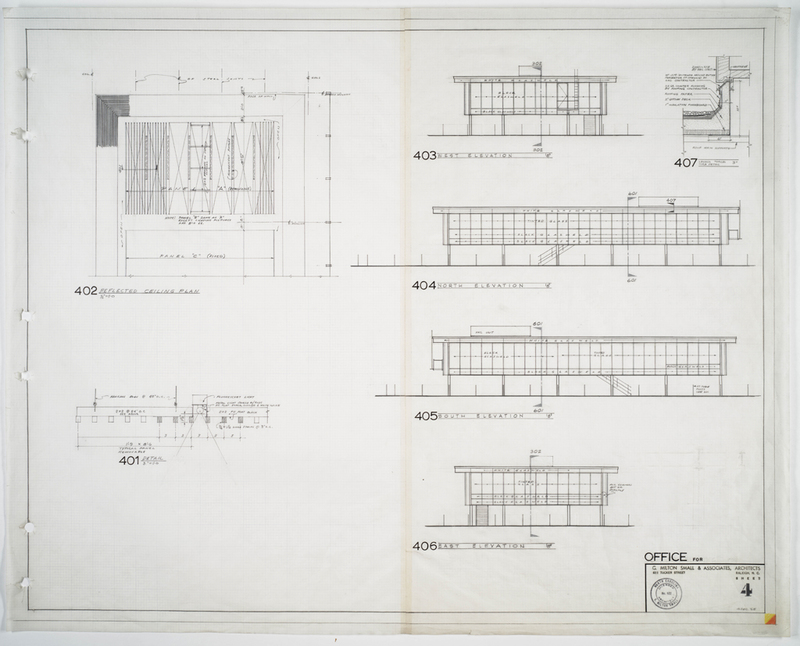 Even the original custom architect-designed cherry and painted steel display fixtures were made here in Raleigh by a gentleman who later received the Craftsmanship Award from the national AIA. Thanks for the post, John, and the terrific photos. I disagree, the building no longer looks as iconic as it was when originally built. The facilities are inadequate for their current purpose and difficult (even scary at night) to walk around. The expansion that took place may be the issue with the building as it currently stands. I rarely see students hanging out around the building and welcome the planned green area. Though I am aware that grassy lawns are bad for the environment and are in no way “greener” than leaving a building where it stands. Perhaps architecture students aren’t speaking up because they hope modern, and more adequate, architectural landmarks will brought to campus? Isn’t the idea of having a cutting edge school of design, to constantly change and bring new ideas to campus? If not torn down, the building needs to be renovated or updated to fir the needs of the school. I love your blog, and appreciate what you did for the light mural in the library. 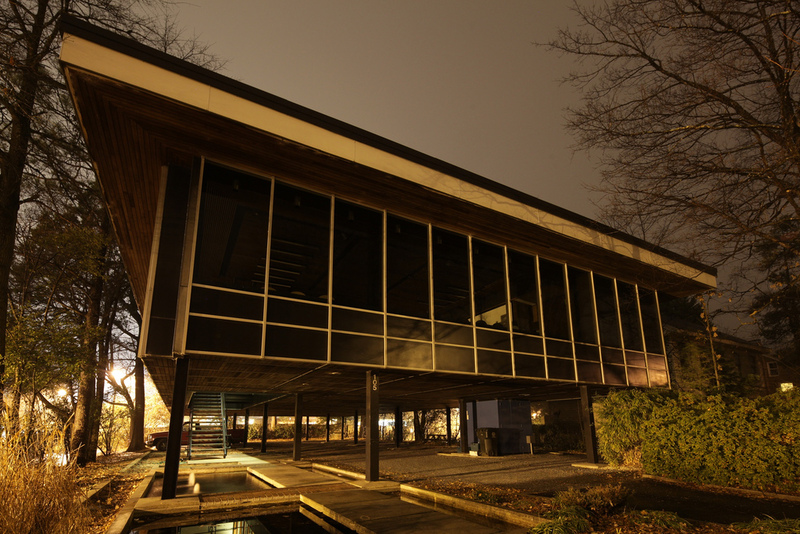 If it is torn down, can the canopy still be saved to grace the green space? It doesn’t have to be “all or nothing”, I hope. In a similar vein, cannot a creative architect craft some sort of retrofit option that would honor some of the original stylistic intent but accomodate curent needs, instead of just erasing history and starting over? Study that looked at the big picture for student life needs. This study was vetted by a number of students, faculty and staff across campus and was approved by the Board of Trustees. built in 1972, it was to accommodate a student population of 14,000.
of up to 40,000. The building will expand from 169,000 gross square feet to 283,000 gsf to better accommodate the current and future student population. 2. The existing Bookstore siting is not an efficient use of land area. buildings needs to increase on the existing acreage of land available. This two-story structure will now be folded into a five-story building. prominent presence with greater visibility. In its future home, it will be able to take advantage of being visible and accessible from Cates Avenue and accessible from Dunn Avenue as well. By being folded into the building where numerous food venues, student organizations, meeting spaces, services, offices, Stewart Theatre, new Ballroom, etc., are located, more people will pass by or through the Bookstore on their way to other destinations and vice versa. 4. The dollars needed to renovate this building would still not produce the quality proposed for a bookstore to be current. In other words, it would take more money to try to retrofit it properly than to move it to a better location, and the results would be questionable for the project as a whole. the end of their useful life. The Bookstore was built in 1959 and added to in 1971. Code requirements have changed significantly since then. Again, the dollars needed to renovate this building would still not produce the quality needed for a current bookstore or any other campus organization/service. go.ncsu.edu/newtalley . We expect the final plans to be posted there in mid-March. Michael, I should add that we are talking about ways to preserve some of the architecture from the Bookstore (like the canopy), but nothing specific has been determined yet. Thank you for taking the time to comment on this article. There is an unfortunate linking of the structure as it stands and NCSU Bookstores. The Bookstore can be relocated to the new student center, but it isn’t necessary to demolish the building simply because of the relocation. 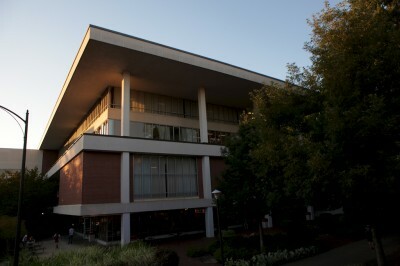 DH Hill Library was originally located in Brooks Hall. When the needs of the library outgrew the building, NC State didn’t tear it down – they put it to use for other needs. Can you imagine what we would think of NCSU officials if they had decided to demolish Brooks Hall? I understand the point about needing to expand, but is the green space immediately to the east of the building inadequate? Additionally, has any consideration been given to remove the 1971 expansion in order to facilitate this? The original footprint of the building could still be put to use. How will NCSU increase building density by replacing it with a green space? According to the project and what you’ve stated, the current structure will be transformed in to a “green space”, and not rolled in to a five-story building. There is a difference between NCSU Bookstores and the structure in which it currently sits. While I can see and understand this need, why must the structure be demolished? Why can the Bookstore not be moved to the new student center, and the current structure be repurposed to fit another need? Again, I don’t dispute the fact that the current Bookstore building is inadequate for the purpose in which it serves. Why must the building be demolished and green space be left in its place? This is true, but very few buildings on campus are (Holladay Hall is the only one I know of). As was pointed out in the article, it has been placed on the “Study List” for the National Register. Most state-owned buildings are designed to last 50 years before they reach the end of their useful life. I think it’s disingenuous to suggest that architects build planned obsolescence into the structures they design. What would NC State look like if we knocked down buildings once they reached 50 years old? This building is important to the history of NC State and it’s really sad it will be knocked down and replaced with a “green space” that already exists to east. It is not necessary to raze this building in order to meet the needs of the growing student population. The current bookstore should be saved and repurposed as something like a snack shop, or something. Out on Centienial there is plenty of space for these huge buildings they are planning. 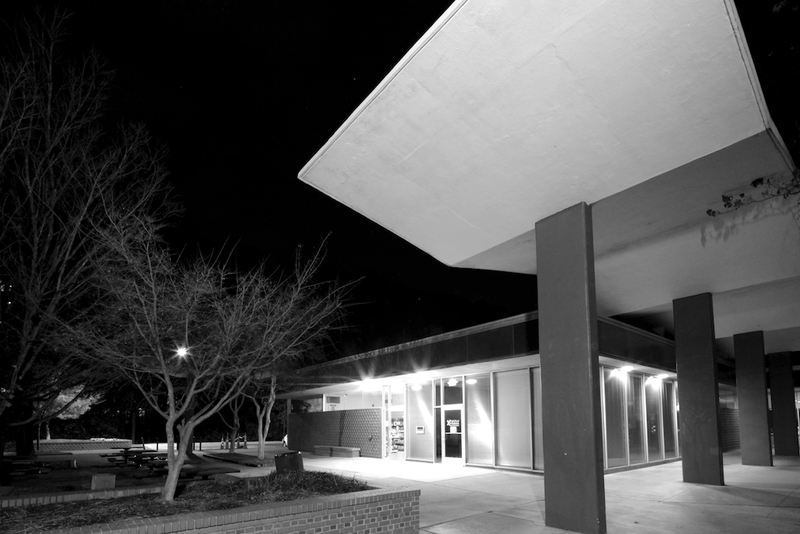 Younger generations may not appreciate that the Bookstore was avant-garde in its day, since mid-modern architecture continued to be built until the 1970s. But the fact remains that the building is one of the most iconic modernist landmarks on the NCSU campus. In fact, since the Student Center along Hillsborough Street has been so altered, this is the finest modern building remaining on campus. 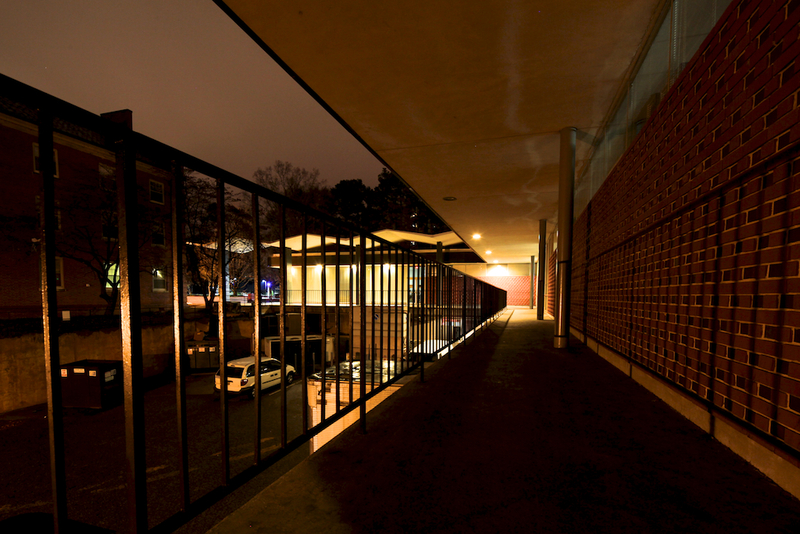 The Fifties and Sixties modern buildings created by faculty architects of the School of Design ON THE CAMPUS are part of the visual legacy of NCSU’s physical plant that should be cherished and celebrated, instead of being torn down. These School of Design-related buildings are nationally famous. It seems incredibly short-sighted for the current administration to be wiping out this legacy. A significant percentage of Chicago’s tourists come to look at the landmark skyscrapers of the “Chicago School of architects” (think Sullivan and Wright) of the late 1800s. 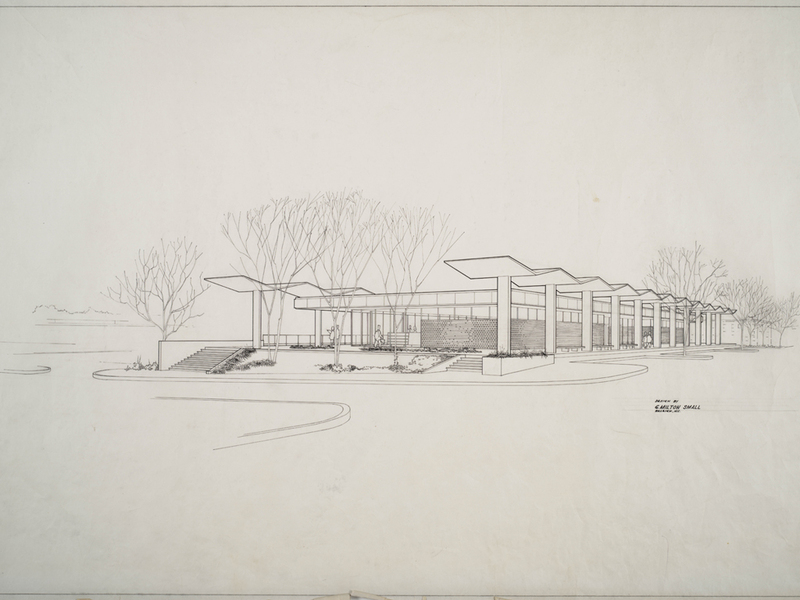 I forsee the time when Raleigh will have its own modern architecture tourist trail. If the bookstore is torn down, a vital stop on the trail will be destroyed. Do you happen to know what would need to be done to get the Bookstore off the Study List, and onto the National Register of Historic Buildings? Is there any kind of “endangered species” list that pushes buildings like this up in priority (it’s been there 5-6 years, after all)? I clearly don’t know much/anything about the list, but it seems like if we could -just- get it registered as Historic, they’d have no choice but to re-plan the Talley renovations. You would have to prepare a National Register Nomination in order to get the Bookstore listed on the NRHP. Depending on how comprehensive the study list application was, it may or may not require quite a bit of research, documentation, and preparation of the report and materials. Then it has to go through the SHPO for approval, and then on to the National Park Service for approval. Needless to say, this can be a very long process. And even if it does get listed on the NRHP, that doesn’t prevent it from being altered or demolished (except if there is federal money involved, which, in that case would have to go through Section 106 environmental review) but it would certainly make someone think twice about tearing it down with an NRHP status. Strong opposition from students and community members couldn’t hurt in making the case. 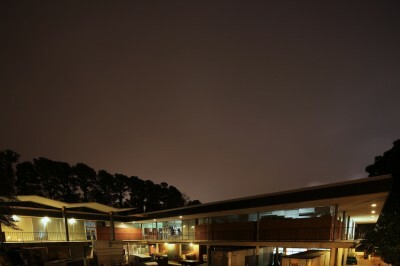 I REALLY hope NCSU makes the right decision to retain and preserve this modernist landmark!!! Last year, I attended one of the open houses with the designers for the new Talley center, and a question was asked regarding the demolishion of the existing bookstore building. There actually IS a purpose for demolishing the current building. The new Talley center will need a loading area for its occupants, as well as generators and other unsightly operational mechanisms. These are currently located behind a brick “fence” between Talley and Reynolds Colisseum. The new Talley will encompass that current loading area, and the new loading area will be underground, at the current bookstore location. The green area above ground will hide the unsightliness of the loading/mechanical area. I have no opinion regarding demolishing the building, however I do like the idea of keeping the trellis’ as a reminder of NC State’s history. I have fond memories of the main bookstore. It’s bad enough that Harrelson Hall is slated for demolition, but adding the bookstore to the iconic structures being removed pains my heart. During my days there, the bookstore wasn’t just the place to pick up books or State gear. 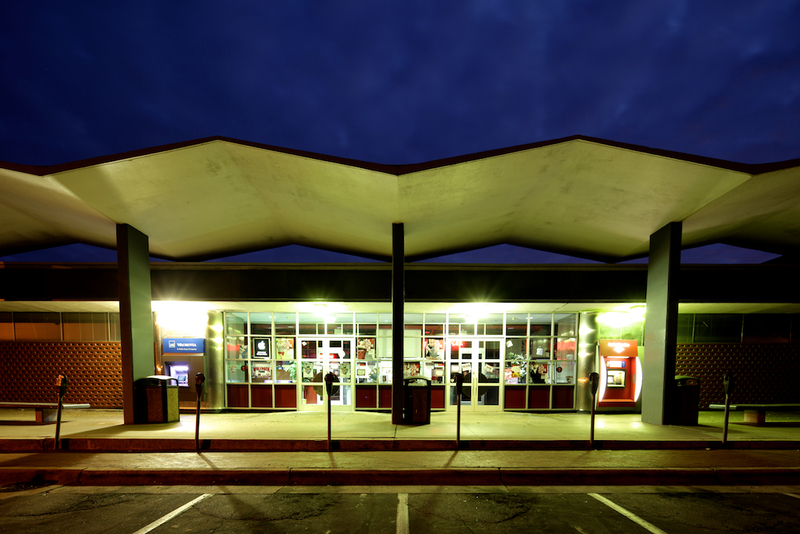 It also had a C-store that was convenient for picking up a quick breakfast on the way out to Tompkins and Winston, or for picking up a nightcap on the way back in from night classes. And having a First Union ATM outside meant I didn’t have to walk all the way out to Cameron Village to get money. There’s no doubt that NC State’s population is growing, and on the main campus, there isn’t much room to throw up new buildings. I was there when Witherspoon Student Center was built, and I remember the uproar when the original plans were shared. If built, it would’ve taken up most of Harris Field, the space behind Harris Hall and Pullen Hall, at the northeast corner of Cates Avenue and Dan Allen Drive. The current building was built to leave as much green space as possible. My alma mater must continue to move forward, in order to continue providing the kind of value that it does for students from around the world. I’m sad, but I understand. Even today, while my daughter attends NCSU, I will occasionally stop on campus simply to visit “the bookstore”. A creation of simplicity and and unadorned beauty is what draws me there. I cannot appreciate why in any era, but particularly one of limited funds, the University would want to destroy a building that should be repurposed. I hear constant complaints from my daughter about how overcrowded D H Hill is with students unable even to find a chair to sit in. What a wonderful study space “the bookstore” could become. Open spaces for individual study and the creation of study rooms for groups to reserve. Surely someone at the University will see how much more valuable this asset is both for its history and for current and future students. What a wonderful read! I visited the Student Supply Store on my very first day on campus: August 23, 1984. During my five years there, I went to the SSS numerous times for stuff. Should I be ashamed or embarrassed that I had absolutely no idea how special that building was until I read that the store would be closed and the building destroyed? After reading your nice piece, I am struck by sadness that I may not get a chance to really look at the building and appreciate it for a unique design; I didn’t pay much attention to stuff like that when I was in my teens and ’20s. I, too, am shocked that the University seems so hellbent on destroying this special, and possibly historic, building, built by a professor of its own School of Design. I know they need the space but geez, destroying a notable building should be the last thing until all other remedies have been considered and administered. The student body, no doubt, had no idea that they were effectively voting for the destruction of an architectural delight when they rejected the fee increase. Doesn’t sound like too many students went to the polls, either…and that regardless of the outcome of any vote, the University was going to do what it wanted to do, anyway. Were all the facts presented? Maybe a late publicity push about the building’s significance could get a groundswell of support built up to at least put a halt to the process until other options could be considered. I’ll be following the sequence of events through your blog. I understand the sadness on seeing some of the beautiful buildings go, but they’re not in the best shape as is. I for one dread working in there. the floors are warped and they make your feet hurt so bad from walking on the uneven ground. The cashiers stand on cushioning pads, but it does little to help. there are large cracks in the ground and larger lumps. The students can’t fit and it raises tensions and confusions at the beginning of the semester. The inside is dated an unappealing, unfortunately much of campus appears equally dated. The outer structures remain beautiful, but the insides are a whole ‘nother matter. I don’t disagree that seeing buildings that stood as a testament to the college go down is very sad. that doesn’t mean it isn’t time. NC State has to compete on a visual level for CURRENT young people. The structures all look interesting, but end up giving an overall feeling of bland endless brick buildings that are not as appealing as other in state colleges. The insides ARE DATED, smell dated, and appear worn. The rare exception may be D.H. Hill with their newest upgrades. Truth be told Some of these buildings have serious structural problems after all these years. Then there is capacity. NC has more and more children here than ever before. They should not have to turn so many away because they just can’t fit them. D.H. Hill can only fit 30% of the students in the college. The bookstore can barely pack in 100. Talley could not handle foot court mall traffic on a boring Wednesday. Parking is a serious problem for employees and students alike, and the college can not expand, they can only rebuild. It IS sad but the a bigger goal for the college should be to be able to absorb worthy students who want to go to a state school, and to address the wants and needs of that populous, who like sleek, bright and modern. I believe that the current University Officials would probably love nothing more than to raze Main Campus and build everything new out on Centennial Campus. And how ugly would that be? This started when they abandoned the Chancellor’s MANSION on Hillsborough Street and build that brick monstrosity on Centennial. Because, suddenly, the heart of the University was on Centennial. I go to state and while I can appreciate Mr. Small’s other architectural achievements (I’m particularly fond of his former office on Hillsborough), old Talley to me was a musty eyesore. My first semester at state was one of the last old Talley was fully in use, and I was so off put by the place I only went there twice, once to check it out, and the other to vote in the 2012 election. Now new Talley is complete, and I spend time between classes there at least a couple times a week. It’s beautiful, modern, full of gorgeous natural light, and welcoming. I am, on the other hand, pretty sad that they’re testing Harilson down, that building is weirdly designed, but Its an MC Escher kind of weird. Also, I would greatly disagree that NC State is one of the ugliest campuses, there are some ugly buildings (not a fan of DH Hill from the outside) but many of the buildings have a lot of subtitle beauty and charm to them. As a former student at State and a friend of the late Horace Farlowe, I would like to know what happened to the marble fountain. Was is destroyed? Is it sitting in a warehouse when it should be at the new museum at the old chancellor’s residence? Was it stolen?